In this paperback reboot of the popular 2012 title, readers will find a collection of the most up-to-date and thrilling DIY tech projects around—straight from the experts at Popular Science magazine. 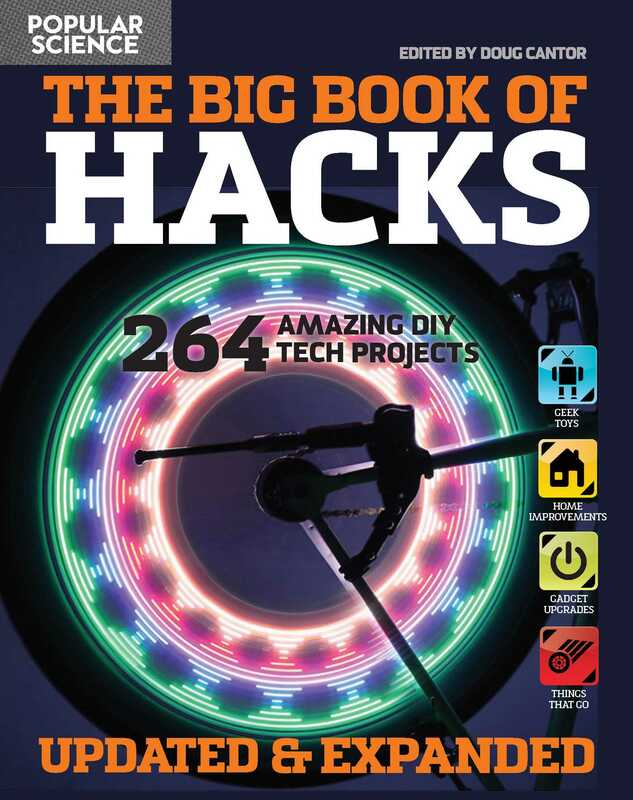 Updated with new and more modern projects, the Big Book of Hacks is the perfect book for aspiring makers, curious young techies and old-school enthusiasts alike … especially any who love using a soldering iron! BASIC MAKER SKILLS From setting up your workspace to using basic hand and power tools to tinkering with robotics, find the top tips and essential skills every maker and maker-in-training needs to be successful. Other skills include 3-D printing, lasercutting, CAD design, and more! GEEK TOYS Be the life of the party with quirky drinking amusements, amazing pyrotechnics, and robots. Includes projects for installing a shower beer caddy, freezing LEGO ice cubes, wielding a potato launcher, building an LED-light dance floor, and constructing a light saber, with updates like a sword that detects free Wi-Fi, a solar-powered rover that really goes, a replica of a Roman catapult, and more! HOME IMPROVEMENTS Pimp out your pad with a laser-security system, an improvised sous-vide cooker, a secret door, an aquarium in an old TV, the perfect gaming chair or a life-size cardboard display of anyone you want. New projects include a sensor that lets you control your home’s temperature and energy use from afar, an automated pet-feeder, and a light made with pennies! GADGET UPGRADES Want to use an XBOX 360 controller as a phone case or build a polygraph test? Looking to brighten up a standard flashlight or charge your phone with solar rays? Improvise a fisheye lens for your camera or dye your laptop? Now you can upgrade many household items without breaking the bank. Look for updated content, such as a hacked radio that lets you listen to meteor showers, your very own DIY particle detector, and a cool soldering stencil. THINGS THAT GO Give your motorbike a Tron vibe or make a unicycle out of an old bike, deck out your car with an action-figure hood ornament or install a bed in your van, upgrade your kayak to a sail boat or take aerial photos with a balloon. Find these mobile projects and more—plus new stuff, like a heart-rate monitor you wear on your sleeve, a bike jacket with flashing turn signals, goggles with prescription lenses, and a bicycle-powered generator! With its clever tone, step-by-step instructions, and useful diagrams, every project is accessible to people of all ages. Find all the ingenious and hilarious projects that every techie will enjoy, in the upgraded The Big Book of Hacks. STEP 1 Lift up and rotate the nail clipper’s little lever. STEP 2 Glue the bottle cap onto the lever, leaving a little room for your fingertip at the very end. STEP 3 Load it up with supersmall ammo, pull it back, and let go to launch.